When Bakkavor Foods announced a few short months ago it was setting up shop in the Lucas Point Industrial Park in Cobourg, promises of up to 150 jobs were heralded as a victory for the town and unemployed workers in the area. Scheduled to open in April 2011, 30 jobs were up for grabs with a goal of 70 in total after two more years. The company, a subsidiary of Bakkavor Foods U.S.A., based in the United Kingdom, employs 19,000 workers in 10 countries around the world. They process fresh agricultural products to sell in supermarkets, and with Cobourg so close to both farms and Highway 401, our location is just right for their business. But now, with the company hiring actively through the town’s Business Centre, it turns out these much needed jobs aren’t actually with Bakkavor Foods, but with one of the area’s three temporary work agencies, Staffing Solutions. While at first glance a job is a job, and the unemployed are happy to have the work, working for a temporary agency isn’t quite the same as working directly for the actual employer, and the huge growth of temporary employment agencies has brought with it a set of new problems. According to a report published by the Workers Action Centre in Toronto called “Working on the Edge” published in 2007, across Canada in the 1990s, there were 1,300 temporary work agencies with a total revenue of $1.5 billion. By 2004 there were 4,200 of these agencies with an incredible $6 billion revenue. 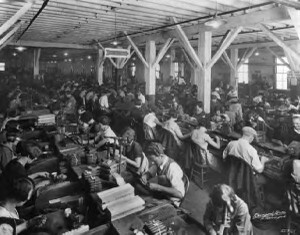 By then, an astounding 37 per cent of all Canadian workers were not employed in traditional full-time, permanent jobs with one employer, and many of these marginalized employees turned to temporary employment agencies out of desperation. In Cobourg, there are three temporary employment agencies listed on the town’s Ecomonic Development website. Besides Staffing Solutions, the company used by Bakkovar Foods, there is also I.S.2 Staffing Services and Qualified Personnel Solutions. In recent years, some of our local manufacturers have begun using one or the other of these agencies to hire employees on a regular basis. While that seems to suggest a loss of control of the workforce, they have compelling reasons to do so, all involving the bottom line and profits. Temporary workers can’t join unions and aren’t subject to union contracts specifying wages and working conditions. They are paid much less than the people they work beside, and unless hired directly, will always be second-class in terms of pay and benefits, which are non-existent through the temporary agency. The time consuming job of payroll is turned over to the agency, along with disciplinary functions. The temporary worker has two bosses, the supervisor at the place of employment, and the temporary agency, who trains and pays them. They get no work without the support of the agency, who can leave them to languish at home without work, if they choose, leaving unsatisfactory workers in limbo without recourse to unemployment insurance and with major obstacles to receiving welfare. In the past, worker abuse by temporary agencies was rampant and the Employment Standards Branch of the Ministry of Labour wasn’t much help since their rules were predicated on the standard employer/employee relationship, which didn’t apply very well to temporary workers. After a concerted campaign by the labour unions and their allies, the worst of the abuses were stopped with the imposition of new rules approved in November 2009. The most significant of these included the right to holiday and termination pay, the banning of fees charged to employees and ensuring the temporary agency couldn’t prevent an employer from hiring the worker, even though the company would pay a fee to do that if the permanent hiring occurred within the first six months of the placement. While more needs to be done, the 2009 changes at least offer workers some protection from ongoing exploitation at the hands of unscrupulous agencies. Where does this leave us here in Cobourg? Bakkovar Foods is simply doing what corporations do, maximizing their profits while reducing expenditures on the backs of their workers. They are not the only local businesses taking that route, and the sight of unionized workers making $20 an hour working alongside temporary employees making $11 has become commonplace in local factories. It’s not hard to imagine what the outcome of this will be and at the point will hardly anyone earns a living wage anymore. The scenario doesn’t bode well for our community, since underpaid and insecure workers can’t get mortgages or credit and can’t take their part in participating in the local economy. As Nelson Mandela says, “insecurity for some is insecurity for all”. Drive Time host Dave Glover talks to newly-minted local MPP David Piccini about his plans for Northumberland Peterborough South as he gets ready to take in his responsibilities at Queen's Park on Northumberland 89.7 FM. If this is the future of economic development in Cobourg it won’t just be mortgages and credit that these insecure workers won’t be able to obtain–they also won’t be able to afford good quality public services and will most likely support measures (or political agendas) to keep such “costs” low. This does not bode well for what has been traditionally, in my opinion, a “quality of life” community. At this point I’m curious to know if there were any taxation “incentives” (or indirect public subsidy of a different kind) were offered to Bakkovar Foods to locate here? An excellent story, Deb. Keep them coming!